^ 1.0 1.1 1.2 Commuter plane crashes into house. upi.com. United Press International, Inc. 2009-02-12 [2009-02-12]. （原始内容存档于2009-02-15）. ^ Photo of N200WQ. Airliners.net. 2008-12-23 [2009-02-13]. （原始内容存档于2009-02-19）. ^ 3.0 3.1 3.2 3.3 3.4 50 killed as plane slams into home near Buffalo. MSNBC. 2009-02-12 [2009-02-12]. （原始内容存档于2009-02-14）. ^ Hradecky, Simon. Crash: Colgan DH8D at Buffalo on Feb 12th 2009, impacted home while on approach. Aviation Herald. [2010-02-02]. ^ 5.0 5.1 Carey, Elizabeth. Buffalo area plane crash claims 50 lives. The Business Review. 2009-02-13 [2009-02-13]. （原始内容存档于2013-12-16）. ^ "FAA Registry: N-Number Inquiry Results" 互联网档案馆的存檔，存档日期2016-01-27.. Federal Aviation Administration.. Retrieved 2009-02-13..
^ "Co-pilot of crashed plane was from Wash" 互联网档案馆的存檔，存档日期2009-02-17. (2009-02-13). Katu. Retrieved 2009-02-13. ^ Frequently Asked Questions – Colgan Air Flight 3407 (PDF). 2009-02-24 [2009-02-26]. （原始内容 (PDF)存档于2009-03-04）. ^ 12.0 12.1 NTSB Report 互联网档案馆的存檔，存档日期2013-06-26. ^ Plane with 49 aboard crashes into house in suburban Buffalo. CNN. 2009-02-13 [2009-02-13]. （原始内容存档于2009-02-13）. ^ Mom, daughter escape after plane crashes into home. cnn.com. 2009-02-13 [2009-02-13]. （原始内容存档于2009-02-16）. ^ NTSB: Plane didn't dive, landed flat on house. MSNBC. 2009-02-14 [2009-02-14]. （原始内容存档于2009-02-14）. ^ 50 killed as US plane crashes into house. Dawn. 2009-02-14. （原始内容存档于2009-02-19）. ^ All Calm Moments Before Plane Crashes 互联网档案馆的存檔，存档日期2009-02-14. (2009-02-13). CBS News. Retrieved 2009-02-13. ^ 19.0 19.1 Dale Anderson and Phil Fairbanks. Federal investigators begin searching for the cause of Clarence Center crash. The Buffalo News. 2009-02-12. ^ Precious Yutangco. 49 killed after plane crashes into home near Buffalo. Toronto: Toronto Star. 2009-02-13. （原始内容存档于2010-01-23）. ^ Transcript of CVR recording 互联网档案馆的存檔，存档日期2009-06-11. ^ Victims of the crash of Flight 3407. (2009-02-18). Buffalo News. Retrieved 2009-02-18. ^ Black Boxes Found From Buffalo Crash. cbsnews.com. 2009-02-13 [2009-02-13]. （原始内容存档于2009-02-14）. ^ Andy Pasztor. Ice likely not a big factor in Buffalo plane crash. Wall Street Journal;. 2009-03-25 [2009-03-26]. （原始内容存档于2009-03-28）. ^ Sherwood, Ben. Wing and a Prayer: How Safe is My Next Regional Plane Flight?. Huffington Post. 2009-06-15. （原始内容存档于2013-12-13）. ^ Andy Pasztor. Captain's training faulted in air crash that killed 50. Wall Street Journal. 2009-05-11 [2009-05-11]. （原始内容存档于2009-05-14）. ^ Gregory Polek. 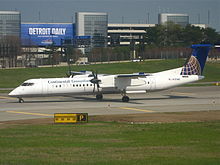 NTSB scrutinizes pilot actions in Q400 crash probe. Aviation International News. 2009-05-12 [2009-05-12]. （原始内容存档于2009-05-15）. ^ FAA will require airline pilots to have at least 1,500 flight hours. Dallas News. 2013-09-09 [2013-09-09]. （原始内容存档于2013-08-14）. ^ Goyer, Robert. To Push or to Pull. Flying (Bonnier Corporation). July 2011, 138 (7): 8–9 [2011-07-04]. （原始内容存档于2011-07-04）. ^ Pilots Set Up for Fatigue, Officials Say. New York Times. 2013-09-09 [2013-09-09]. （原始内容存档于2013-04-30）. ^ The U.S. Airline Pilots Who Barely Make Minimum Wage. skift.com/. 2013-09-09 [2013-09-09]. （原始内容存档于2013-09-01）.